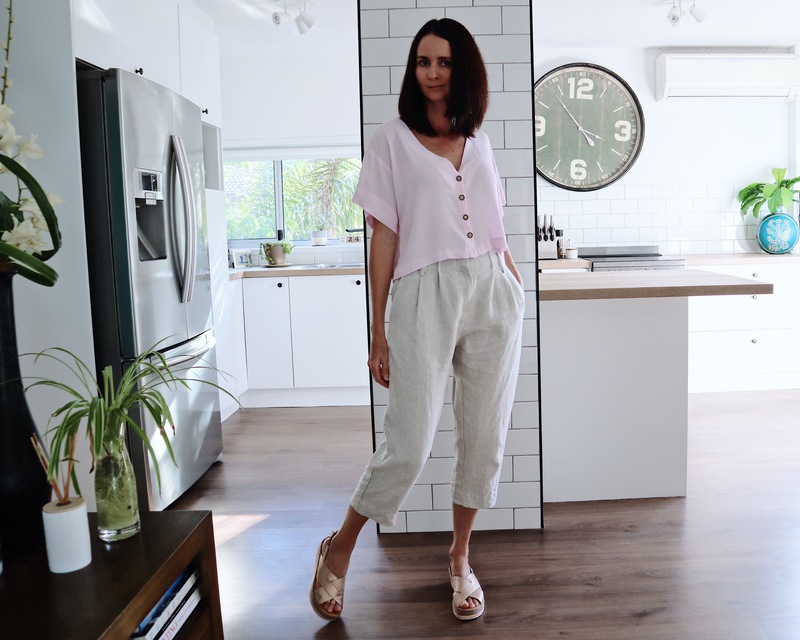 The first thing that popped into my mind when I saw this top on Instagram was versatile, easy to wear and I must have one, or two, or three or four in my wardrobe. I also love the aesthetics of it’s creator The Hemming who is a fellow Gold Coast maker. Wear it with jeans or linen pants, a high waisted skirt or a pair of shorts. The options are limitless. The pattern is sold as the Adelia Dress with a little tutorial on how to shorten it into the Adelia Top on The Hemming’s website. Many of the versions I have seen of this top have been made from linen or linen blend fabrications. I decided to give it a go in a polyester crepe from The Fabric Store. To work out the length that will best suit you and your current wardrobe, I recommend putting on the bottoms that you would like to pair with your top once it has been made. Then measure from you High Point Shoulder (top of your shoulder close to the neck) to the length you would like your top to sit on your chosen bottoms. Next add seam allowance. I made an error in judgement here and didn’t add enough seam allowance at the hem to match the sleeve hem and my hem ended up smaller than I would have liked. It was a quick and easy make that I was able cut and sew within a couple of hours on a Saturday morning. My other error of judgement with this piece was my choice of top stitching thread. I was not able to find the perfect colour and opted for a darker thread instead of a lighter colour thread. This left a really obvious stitch line at the centre front placket. I opted to up pick and left the front with a clean finish only being held down with the buttons and button holes. As always, I finished my garment with the one of a kind woven label from Kylie And The Machine. I love her labels and the finishing touch they bring to my home made garments. Previous Post How to make a clashing print 1/4 circle swing skirt….